In 2010, SERCUL received $4 million of Australian Government funding through the National Water Security Plan for Cities and Towns Program under the Water for the Future Initiative to support the Urban Waterways Renewal projects (UWR). This consists of a suite of 11 sub-projects aimed at reducing nutrients and pollutants entering the Swan Canning Riverpark in Perth, WA. Matching funding and in kind support has been provided by State Government initiatives; the local governments of Armadale, Gosnells and Canning; the Department of Water, the Swan River Trust (now Department of Parks and Wildlife), Community Groups and the Water Corporation. The first stage consisted of community consultation, concept designs, engineer’s plans and approvals as well as site preparation, weed control and upland planting. Finally earthworks commenced in the summer of 2011 with the construction of wetlands, swales and basins as well as the installation of rock riffles, treatment media and pollutions traps. The winter of 2012 was all about planting and ongoing weeding and maintenance. The aim of this project is to enable the final sections of Bannister Creek to be restored to perform as a living stream, maintaining its function of carrying stormwater from the surrounding industrial and urban catchment and to restore it to an attractive parkland area for recreational purposes. The reach of Bannister Creek identified for the UWR living stream restoration project runs for 2km from Acacia Place weir in Lynwood to Hybanthus Road in Ferndale. This section of the creek offered the opportunity to install pollution treatment interventions in combination with river restoration techniques to improve water quality, parkland amenity and environmental values. 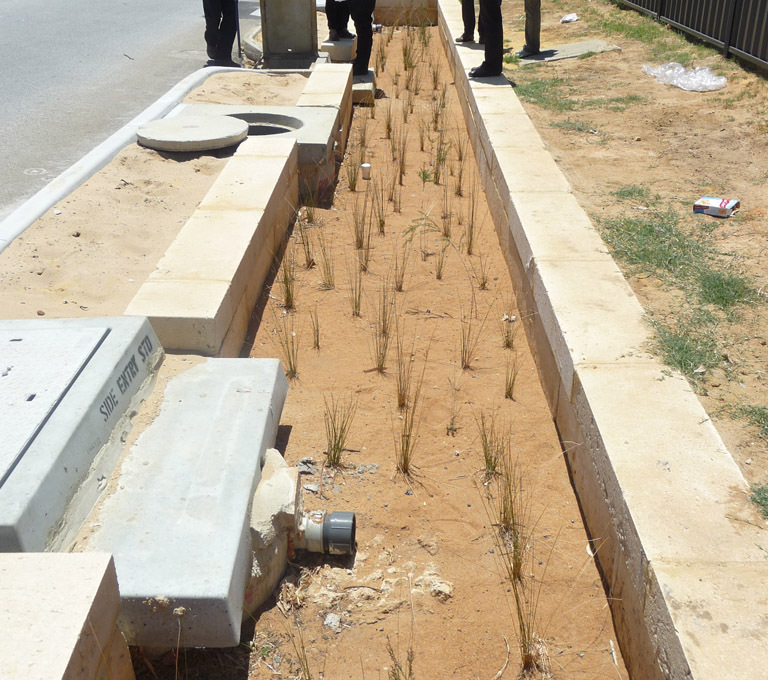 The project, in partnership with the City of Canning, used best practice in river restoration design and reconstruction of a drain into a living stream. River restoration techniques used included the installation of three originally designed ‘treatment media holding structures’ that were installed within three separate rocky riffles. Drain banks were reconfigured and shaped, massive weed barriers were removed to regain hydrological access to the natural floodplain and a 70 metre section of the waterway was redesigned into and through the natural floodplain to enable the paperbark plant communities to be reconnected to the waterway. The Bickley Brook has been a significant contributor of nutrient, heavy metals, hydrocarbon and sediment to the Canning River. The Bickley Brook Water Quality Improvement Plan (WQIP) highlights the need to address a range of issues within the catchment. The Bickley Brook is a natural stream that has been highly modified. The brook passes through the semi-rural suburb of Orange Grove then through the Maddington Kenwick industrial area before discharging into the Canning River. Once the brook enters the industrial precinct, much of the system is in the form of a trapezoidal drain with steep edges and limited space for ecological style interventions. The UWR Bickley Brook projects work on different aspects of the WQIP through the engagement of the local community, raising the awareness of the brooks connections to the Canning River and to commence the work required to enhance the environmental values of the Bickley Brook. The project aims to increase the natural system ability to retain and uptake nitrogen and phosphorus through the reconnection of the brook with its natural floodplain. The Bickley Brook Confluence project encompasses approximately 8000m2 of floodplain, located adjacent to the Royal St Bridge in Kenwick, which is within the 100 year flood levels of the Canning River. The main channel of the Bickley Brook had been straightened and trapezoidally excavated through its natural flood plain. This has resulted in the existing channel having steep eroding banks with limited connection to the surrounding floodplain. The main objectives of this project were to re-establish a native vegetation complex and to reconnect the Bickley Brook with the floodplain. The connection with the floodplain was achieved via an extended flow path through a vegetated swale which returns back to the main channel and a high flow path to enhance water flow through existing damp depressions within the flood plain. The project aim was to convert approximately 200 meters of urban drain into a living stream, increasing the natural system’s ability to retain and uptake nitrogen and phosphorus. The reduction of contamination entering the stormwater system throughout the stormwater network was targeted by extending the contaminant investigations out into the subcatchments. The location of this project was also chosen to raise the awareness of the Bickley Brook as a natural river system. The intent was to provide a visually impressive area with appropriate signage which also extended our water resource management education and engagement out into the local businesses. The project initially proposed to replace approximately 200 metres of roadside urban/industrial open table drain in heavy clay soils on Myola South Place, Maddington, with a series of bio filtration systems or rain gardens to improve the quality of stormwater runoff from the roadway, which was ultimately delivered to Bickley Brook at the Myola South Place outfall. 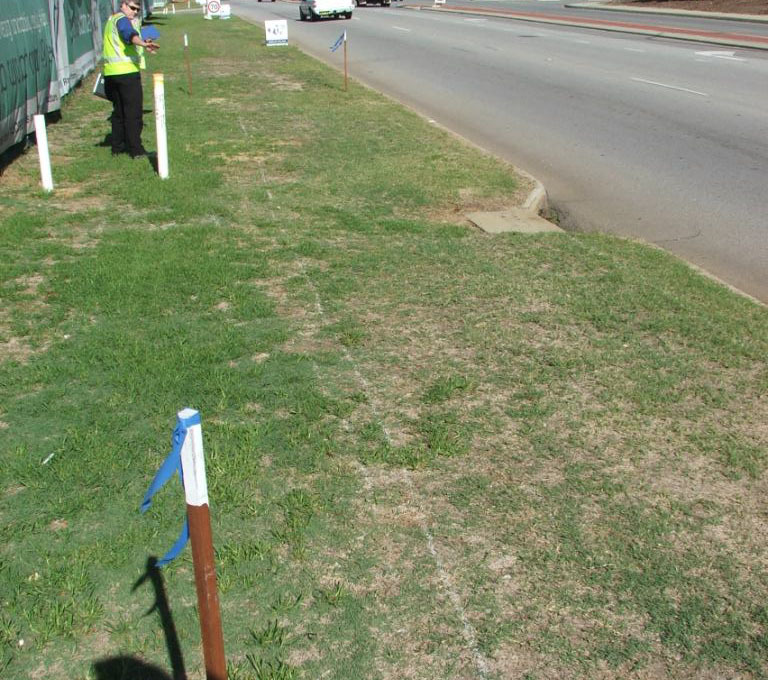 However, after more detailed investigation by the City of Gosnells, relocation to a nearby site on Kelvin Road was proposed. Both sites were evaluated across a range of parameters and Kelvin Road was found to be the more advantageous site, given its lower capital and traffic management costs, significantly heavier industrial traffic volume and consequent stormwater pollutant load. The project aims to increase the natural system’s ability to retain and uptake nitrogen and phosphorus through the reestablishment of a healthy habitat. The intent of the project is to restore a natural vegetation complex throughout this section of the Bickley Brook. The site is located along the Bickley Brook between Eva Street and Tonkin Hwy within Maddington. This section of the Bickley Brook is one of the few stretches of the brook that retain the meanders of a natural waterway. Much of the site was however, dominated by an exotic understorey of Watsonia (Watsonia bulbillifer), Couch Grass (Cynodon dactylon), Morning Glory (Ipomoea indica), Blue Periwinkle (Vinca major) and Giant Reed (Arundo donax). Although most of the site was highly degraded, this reach of the brook encompassed a conservation category wetland and pockets of vegetation remained with highly diverse natural assemblages. When the project commenced, access into this section of the brook was limited. The dumping of concrete, rubble, waste material and a range of other rubbish items were evident throughout the project site. A number of illegal outfalls were identified entering the brook and property boundary encroachment into the reserve was identified as a significant issue to be addressed. The Southern River Catchment has been identified as a significant contributor of nutrient and pollutants to the Canning River. Clearing of native vegetation has caused severe weed infestations, erosion and degradation of the Wungong and Southern Rivers. The Southern River Catchment includes Southern River and its tributaries, Forrestdale Main Drain, Wungong River and Neerigen Brook. The catchment covers an area of ~150km² and is characterised by low lying areas and high groundwater. The Wungong River only receives runoff downstream of the Wungong River dam wall in the Darling Scarp. Many of the wetlands in the catchment have been drained and large areas of the catchment are under increasing pressure from urban development. The catchment is one of the Perth metropolitan areas fastest developing areas. The Cities of Armadale and Gosnells have worked with catchment management groups since 1998 to develop the Upper Canning Southern Wungong Catchment Management Team (now the Armadale Gosnells Landcare Group (AGLG). Three sites within the Southern River catchment received additional funding through the Swan River Trust and State NRM office through delivery of the Southern River Water Quality Improvement Plan. The selected sites offer the opportunity to install pollution treatment interventions in combination with river restoration techniques to improve water quality and environmental values within this catchment. The project aims to reduce nitrogen and phosphorus entering the Wungong River, as well as having additional benefit of significantly improving the aesthetics and biodiversity values of the reserve. The project converted an existing compensation basin into a bioretention basin. By re shaping and revegetating the basin with native vegetation, the sites ability to retain and uptake nutrients was increased and its natural diversity enhanced. Grovelands Basin is located on Westfield Road, in the suburb of Camillo, within the City of Armadale, WA. The basin operates as a detention area for high flow stormwater events that flow into the Wungong River near the Champion Drive outlet. The basin remains dry most of the year and is mostly bare sand with only some weed grass species and non-native Eucalypt species providing very limited canopy cover. The basins harsh site conditions provided very little opportunity for improving habitat or water quality and also created an unsightly corner of an otherwise attractive public open space. This project aimed to improve surface water quality, natural diversity and the visual amenity of the reserve. Additionally, the project aimed to increase awareness within the highly industrialised catchment of the detrimental impact that poor stormwater management and unauthorised discharges were having on water quality being discharged to the Wungong River. Third Avenue and Seville Grove Basins site is located on Gillam Drive, in the Kelmscott Industrial Area, within the City of Armadale, WA. Third Ave. Basin receives stormwater from the Kelmscott Industrial Area. Seville Basin adjoins Third Ave. Basin and receives additional inlets from Seville Grove Shopping Centre, the Kelmscott Industrial Area and part of the residential catchment. The stormwater entering both basins has high levels of total nitrogen, phosphorus and hydrocarbons. Gross pollutants are also an ongoing maintenance issue for the basins. Hard rubbish collected in stormwater run-off from road reserves accumulates in the basin and is transported directly to the Wungong River or to Kuhl Park Basin. The rubbish and debris blocks infrastructure and increases flood risk. This project included the re shaping of two compensation basins to extend the existing surface water low flow path and utilised a combination of amended soil and revegetation to reduce the outflow of nutrient contaminants from ground and surface waters. A gross pollutant trap was installed to reduce rubbish export from the basin. The City of Armadale installed a hydrocarbon capture device at the inlet to Third Ave. Basin. Additionally, a Track and Trace hydrocarbons investigation took place in the Kelmscott Industrial Area to identify potential sources of oil entering the network. The project aimed to reduce the quantity of nitrogen entering the Wungong River redirecting stormwater through a treatment system to reduce contaminants and increase dissolved oxygen levels. The Wungong River forms part of the Southern River Catchment in the metro area of Perth. The Wungong River project site extends approximately 200m north of Lake Road along the east bank of the Wungong River. This site provided an opportunity to convert a closed piped system into an open system that mimics a more natural flow path for surface water across the site. The modifications created habitat for native fauna and provided treatment to improve surface water quality through biofiltration. A new manhole fitted with a diversion baffle directs low flows into a vegetated surface flow wetland constructed on the eastern floodplain of the Wungong River. The water passes through the open wetland and then through a gated weir into a vegetated subsurface flow wetland to create anaerobic conditions suitable for denitrification. This project aims to reduce the quantity of nutrients entering the Wungong River by removing sections of pipe that feed into the river and redirecting the polluted stormwater into a biofiltration basin. The project also aims to improve the aesthetic and biodiversity values of the foreshore and floodplain which was previously a rough mown paddock by removing illegal dumping of rubbish and revegetating with local native plant species. The site is part of the Wungong River floodplain located between Riverside Lane and the eastern foreshore of the Wungong River, in Seville Grove. The site is situated on a stormwater pipe inlet which dissects the Wungong Rivers floodplain and transports stormwater with high levels of nitrogen and low dissolved oxygen directly into the river which can adversely affect aquatic life. The project removed a section of the existing stormwater concrete pipe and created a biofiltration basin to reconnect the river with its floodplain. The modifications reinstated a more natural flow path that would have existed before the Wungong River was engineered as a drainage channel. Filtration media composed of coarse cracked pea gravel lines the base flow channel of the basin and the batters were lined with 50mm of amended topsoil to increase nutrient retention through elevated carbon levels and made plant available to improve revegetation success. The basin was designed to follow the natural contours of the existing floodplain and utilise low points in the banks of Wungong River to create high flow inlets which deliberately reconnect the river with its floodplain. The basin and floodplain was densely planted with native sedges and groundcovers. Dominant tree species such as Melaleuca rhaphiophylla and Eucalyptus rudis were planted to provide a canopy and more accurately reflect the natural assemblage expected along the Wungong River. The project aimed to convert a compensation basin into a constructed wetland and enable water to be treated before it is conveyed to the Wungong River. 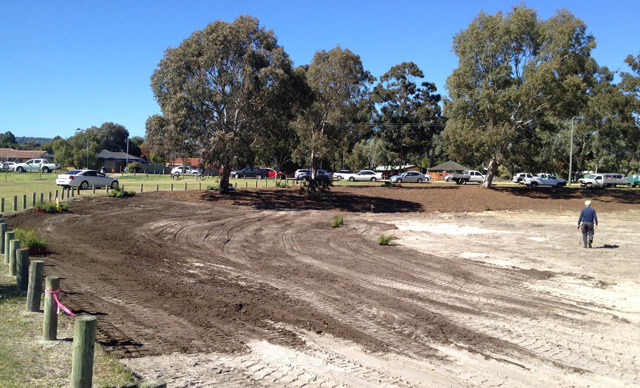 The project site is on Strawberry Drive between Lisbon Way and Fortunella Grove in Seville Grove, Armadale. The Strawberry Drive project site is on Matthew Stott Reserve, vested in the City of Armadale for public recreation and drainage. It is located next to Willandra Primary School and a residential area. This compensation basin was re shaped and revegetated to form a constructed wetland. 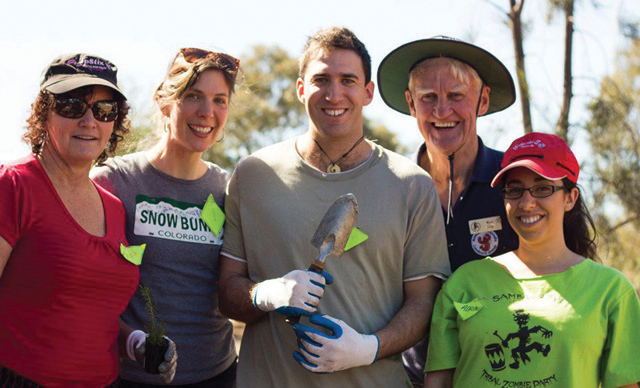 The project involved rubbish and weed removal followed by revegetation using local native plants. This project aimed to reduce the volume of sediment and gross pollutants exported from site. The Williams Rd Main Drain (WRMD) has been identified as a significant contributor of nitrogen and sediment to the Wungong River system, which forms part of the Southern River Catchment. The high flow rates and steep banks exhibited by WRMD have caused erosion, sedimentation, gross pollutant and nutrient export into the Wungong River. The project adopted the principles of water sensitive urban design utilising a treatment train approach to reduce the volume of sediment and gross pollutants exported from site. Erosion control measures and modification to the existing open channel stabilised banks and reduced the surface water flow rate. A biofiltration swale was installed as a secondary treatment to filter nutrients resulting in lower pollutant levels being flushed into the Wungong River.